After a record-breaking winter and an Eagles championship, spring is upon us in Philadelphia, and that means sunshine, (hopefully!) warmer weather, Phillies baseball and ice cold brews. Which particular beer? Where is it located? Fear not, Phillies/beer fans, we got you covered. 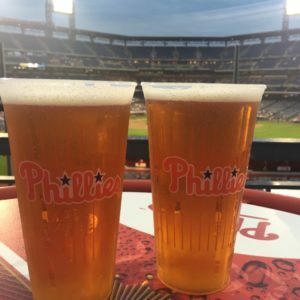 Welcome to our 7th Annual CBP Phillies beer locator! Alley Brewing Co. is no longer in right field. You can get closer to the bullpen in that area now on all sides, as the Wall of Fame has moved to the centerfield entrance, as well. There’s a monster modern bar along the concourse in that corner now. more places to charge your cellphone (while you drink and watch baseball), too! Like the last few years, you’re going to see mega cans and 16-ounce and 19.2-ounce craft cans everywhere and anywhere in 2018. And also like the last few years, you’ll see less diversity and more and more Anheuser-Busch products — be those traditional Bud brands or their premium/craft brands that AB owns (like Goose Island, Devil’s Backbone, and Golden Road). For local beer, you’re only going to find: Flying Fish, Troegs, Victory, and Yards. That’s a much smaller field than we’ve seen in a long time. Founders All Day IPA is at CBP for the first time and in 19.2-ounce cans, too! You’ll find Founders Solid Gold Lager on draft, as well. New Belgium Brewing Company is well represented with Voodoo Ranger IPA on draft, 16-ounce Citradelic Tangerine IPA cans, 16-ounce Fat Tire Lager cans, and 24-ounce mega cans of Dayblazer golden ale. Troegs has 16-ounce cans at the ballpark: Perpetual IPA and Sunshine Pilsner. Plus DreamWeaver Wheat and Sunshine Pilsner on draft, too. I didn’t see Troegenator cans this season yet. Victory offers 16-ounce Hop Devil and 16-ounce Summer Love cans, plus draft, as well. You’re also going to see Yuengling everywhere this year: Lager, Light Lager, Yuengling Black & Tan on draft and in cans. You’re going to see Bud, Bud Light, and Goose Island kiosks everywhere this year, as well, featuring all of their domestic and premium brands. Spiked Seltzers are featured throughout the ballpark this year, too. In the end, beer is a personal choice. Our annual CBP Beer Locator hopes to facilitate your baseball-beverage enjoyment. We hope you enjoy our hard work and enjoy whatever beer is your personal favorite. We’ll be updating all season long. Here’s to a great 2018 Phillies season! High Hopes!